Golden Corral is the exception to the rule that customers don’t like buffets anymore. The Raleigh, N.C.-based chain’s system sales rose 3.7% last year, according to Technomic's Top 500 Chain Restaurant Report. It opened an additional seven locations and now has 489, and average unit volumes increased. At a time when most of Golden Corral’s competitors are experiencing severe sales declines, unit closures and frequent bankruptcies, that kind of performance was more than just good. “We see the numbers, too,” CEO Lance Trenary says in an interview with Restaurant Business. “We see other buffet concepts really starting to decline. And we had to ask ourselves whether buffet dining is still relevant in the consumer’s mind. Consider Ryan’s, where sales fell nearly 45% last year. Or its sister company Old Country Buffet, where sales declined by 37.5%. Then there’s Souplantation and Sweet Tomatoes, where sales fell by 12.8%. Furr’s Fresh Buffet sales fell more than 10%. Western Sizzlin’ sales fell 8.2%. Perhaps the biggest differentiator between Golden Corral and its competitors, besides the bankruptcies, is its ownership. The success of the chain is a testament to consistent leadership and private, long-term ownership. The owners of Ryan’s and Old Country Buffet have filed for bankruptcy three times since 2008, the result of massive debts the company took on following a 2006 merger of Ryan’s Restaurant Group with Old Country owner Buffets Inc. The most recent bankruptcy came in 2016. Meanwhile, the private equity-owned Garden Fresh Restaurants, the owner of Souplantation and Sweet Tomatoes, had $175 million in debt when it filed for bankruptcy in 2016. Golden Corral, by contrast, is a privately held company, owned by Investors Management Corp. Its chairman is James Maynard, who opened the first Golden Corral in Fayetteville, N.C., in 1973. The company has also had little management turnover: Trenary is only the third CEO in Golden Corral history, following Maynard and Ted Fowler. Maynard instituted a “100-year plan” for the company, and all of the chain’s decisions follow that strategy. In other words, the chain is making decisions for the long term because it is a privately held company that will likely stay in the same hands for a long time. Rather than cut back on service or maintenance to improve profits or pay off debt, Golden Corral is making investments in its business. Trenary himself has spent more than three decades with the company, becoming CEO in 2015, and he’s a true believer. He started an interview by talking for a full 20 minutes about the qualities of his chain and its future plans. 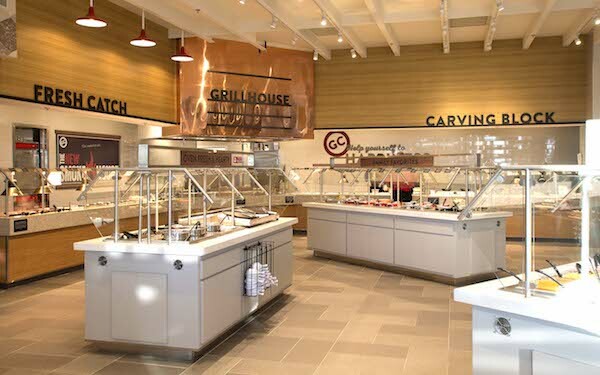 The company is “working hard to contemporize a legacy brand.” The chain is targeting not just traditional buffet users, including loyal customers who visit the chain 80 times a year, but those customers who stopped going over the years. “You can’t survive in the family-dining segment by just being average,” he says. Trenary says the company has been working to improve its service and look, as well as the quality of its food, in a bid to continue luring those customers. Golden Corral also has buy-in from franchisees, important for a mostly franchised brand. Only 53 of the chain’s 489 locations are company-owned. Last year, Golden Corral revealed a new prototype that took two years to develop. The new design spruces up the buffet areas and has a semi-open kitchen to highlight the chain’s grill and its freshly made items. The new design appears to be generating sales at a rate higher than the company expected. The company expected franchisees to remodel 27 to 30 units this year. “Because of the initial success of the remodels, we have franchisees wanting to accelerate their remodel timeline,” Trenary says, noting that the company now expects 35 to 40 locations to be remodeled. Golden Corral is also willing to take a few risks in its bid to improve the image of a traditional buffet. That came this year, when the chain instituted a price increase. The company is using funds from that price increase to invest in improvements to its customer experience, including new uniforms, silverware and plateware. The chain is also increasing the number of workers in a bid to improve service. The success of these efforts helps prove Trenary’s earlier point that when a buffet restaurant is clean and updated and serves good food, customers will come in the door. In cases when a location has been torn down and rebuilt, volumes have increased 50% to 70%. New stores, meanwhile, are generating long lines.